This weeks deck is one of my new favourite decks out there as it is a hunter deck that is different than most others out there. Instead of focusing on quick agro kills, combo wins with Unleash the Hounds, or on multiple beasts, it focuses on control through other means. This deck looks at controlling enemy minions through traps, direct damage, weapons, and minion effects. It aims to win by controlling the board through the measures described above and then killing your opponent with a few select minions, any damage abilities left, and of course your Hunter class ability. The deck plays well against many different decks and does not really have any big weaknesses. It is extremely strong against certain types of decks which happen to be several of the popular decks out there right now. I have been able to get a very high win rate against decks such as Rogue Miracle decks, Warlock Zoo / Handlock decks, Druid decks in general, and several other Aggro decks. This deck has many different key cards made up into several different groups of usage. There are many different control / damage cards, trap cards, and some end game win condition cards. In any deck all the cards are important, and that is the case here as well, so we will only deal with some of the most important cards. Loot Hoarder, Acolyte of Pain, and Azure Drake – All of these cards serve dual purposes. All of them help out with card draw so that you can get a card advantage over your opponent, the other thing they provide is some stalling ability. While Loot Hoarder only has a single health point, he still helps to stall by being able to kill off an enemy early game minion. Acolyte of Pain is a bigger stall and you should aim to get at least 2 cards from it. Azure Drake comes in later and has enough health to try and clear 2 smaller minions, since the deck has so few spells that apply damage the boost to spell damage is not a huge deal, but can help a little. Sen’jin Shieldmasta – A really solid mid game stall minion. At 4 mana for 5 health he can stall an agro deck for several turns. Explosive Trap and Wild Pyromancer – These two cards provide different ways to deal with mass numbers of minions. Both help clear the enemy board while keeping most of your minions alive. While both only deal with weaker minions, they can be teamed up Hunter’s Mark to kill anything your opponent can put on the board. Eaglehorn Bow – This weapon teams up extremely well with all of the secrets that are in the deck. With the 6 secrets in the deck and the 2 bows that means a total of 10 possible attacks meaning potentially 30 damage. The main purpose of this bow is not necessarily to deal with your opponent directly, but instead to clear any of the minions that manage to escape your other removal abilities. Savannah Highmane – This card makes up one of your end game threats. While not strong enough to win the game for you directly, it is strong enough to be a big threat and annoyance to your opponent. Ragnaros – This is your biggest end game win card. While it is only a single card, by the time you can get him on the board, your opponent should not have much health left anyway. Also with all of the removal that the deck has, there should be no enemy minions on the board to worry about hitting instead of your opponent. This deck needs to control the game right from the start of the game and continue that control until you get to the end game. Strong early cards include anything that help you draw extra cards early on or deal with weak enemy minions. Those cards include Elven Archer, Loot Hoarder, Arcane Shot, Acolyte of Pain, and Eaglehorn Bow. While the above cards are good against all opponents all of the time, there are some that you can also look for against rush decks that boost your win chance. Those cards include Wild Pyromancer and Explosive Trap. These are important to have in your hand early against rush decks so that you have them as soon as you opponent has several minions out. This deck is actually fairly simple to play compared to many other competitive decks and that is because a lot of the cards play themselves. It is always pretty easy to decide to bring out a Druid of the Claw with taunt when your opponent has a few minions out and ready to attack, or to use a Keeper of the Grove to silence your opponents Cairne Bloodhoof. However, just because sometimes the cards are easy to pick and to use it does not mean that the deck will win all by itself, there are always going to be choices that need to be made and making the wrong ones will severely hurt your chances at winning a match. The deck plays very strongly when you play to get to the late mid to late game and smash your opponent at that point in time. The early game should be played to control the board and your enemy until such a point as you can attack them directly. The early game control element revolves around keeping enemy minions in check or destroyed. You also should focus on using as many card drawing abilities as you can so that you can store up cards for the late game. Control cards that you should use are Wrath, Swipe, Keeper of the Grove, and Druid of the Claw. Teaming these up with cards like Bloodmage Thalnos and Azure Drake for card drawing abilities. Wild Growth is always a really strong early game card that lets you setup for the late game win by being ahead on resources as well. Once you are into the mid or late game you can start to use your minions to kill your opponent to win the game. While the deck has no real single win condition or single minion that will win a game, it does have several different minions that are powerful in their own right. The deck has 14 minions with power 4 or higher which means it has a lot of hitting power. Top that off with Mark of the Wild to give a minion an extra +2/+2 and Savage Roar which gives all minions +2 attack for a turn. The best use for Savage Roar though is to team it up with Force of Nature to bring out 3 4/2 minions with charge and hit your opponent for 12 to finish them off. Abomination – This minion provides addition stalling and board clearing ability. If you are running up against a large number of agro or rush decks at any point on the ladder then the Abomination can be a good choice to add in, since you do not rely on having minions on board. Baron Geddon – I have seen this minion used in many different variations of this deck. It is extremely strong, especially to help keep the board clear. By the point you can summon him the board should be pretty clear anyway and he can help keep it that way. He can also be used with Hunter’s Mark to remove big minions. Secretkeeper - This minion provides another really strong early game minion in your deck as it will buff up very quickly due to all of the secrets you have to play. However, it needs to be played early and may sacrifice some of your control. Argent Commander – A strong overall minion, that lets you summon him and remove a threat and then still have a strong threat on board. He does not really match up well with the rest of the deck as he is a minion that you really want to stick around, but is a great choice for the mana. Stampeding Kodo - This is another really good control minion that can be added to the deck to help against rush aggro decks. At 5 mana you can kill off one minion instantly, and likely take 2 more with you during attacks, providing you a 3-1 trade. It does have limited late game use and limited use against non-aggro decks. Playing against this deck is all about managing it’s removal, especially if you are playing a rush deck. 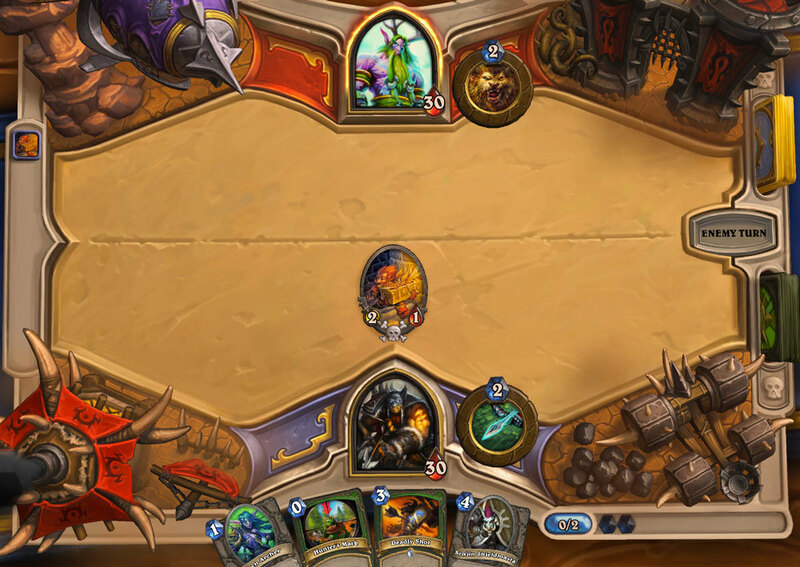 With so many ways to remove small minions or completely clear the board you need to play smart. Playing smart means making the Hunter use cards to remove single minions at a time rather than several at a time. Do not allow your opponent to get value for their cards. This will generally mean playing a lot slower than you would normally like to do (especially with rush decks). Some basic tricks to maximize your odds against this deck are as follows. Try to keep single minions on the board to limit your opponents chance to clear more than one at a time. Always attack your opponent directly when you can, ignore his minions as he will be using them to clear yours. Always attack before summoning a new minion. Always attack with, or summon your weakest minion first if there is a trap on the board. Keep some removal cards or silence cards for the real threats like Savanah Highmane and Ragnaros. Do not burn all of these cards too early and get caught in the late game. Additionally it is important to note that overall the deck only has a few really strong late game threats. If you are playing a deck that has a lot of healing like Priests or Paladins then you can potentially stall as well. Keep yourself alive and wait for them to run out of cards and die from fatigue. This is a fairly new deck for me to play with, but I have had some amazing success with it. I strongly suggest giving this version a try, or making some slight changes and trying your own version of it. Either way, come back here and let me know how it all works out for you. It is defiantly an interesting alternative to most of the other beast based Hunter decks out there.